Music and piano study prove to be instrumental for youth development. The latest research in neuroscience is showing that music and piano education is a powerful tool for attaining children’s full intellectual, social, and creative potential. Through the study of the musical arts, we often see that learning to play an instrument pays off in several very recognizable ways. 1. Learning to read music advances the development of speech and reading skills. 2. Children that take piano lessons show an increased attention span, that can be maintained for sustained periods of time. 3. 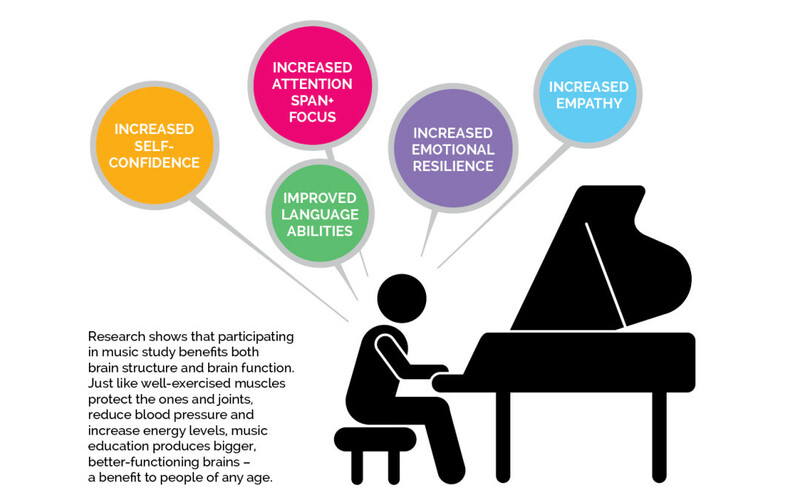 Learning piano helps children develop creativity and gain a sense of empathy for others. 4. Piano lessons build crucial tools for professional life skills like discipline and time management. 5. Playing the piano develops the multi-tasking portion of the brain. It is easy to see that musically trained children are better able to distinguish subtle details of speech, leading to improved reading, better comprehension, and also greater ability to interpret the meaning of what others are truly saying. The cross-over effect of the benefits doesn’t stop there, whether it be a relaxing piano session or rigorous preparation for an RCM examination, we take pride in knowing that North York piano lessons at Encore play a positive role in our students lives. To take the first step in helping your children reach their full musical potential, click here — to register for your complimentary piano lesson and student consultation at Encore Piano Studios.